You can get cinnamon scented bagged pinecones at Michaels. Use a coat hanger and shape it into a wreath. Lay the cones on the table and arrange them the way you want. 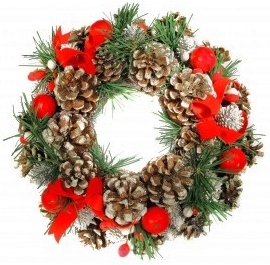 You can use florist wire to attach them to the wreath. Take a look at this video. If you are lucky enough to have access to Colorado there are pinecones all over the place in the mountains. Spend a day looking for pinecones and make sure to dip them in water for a few minutes to remove probable small creatures and then bake them in an oven at 200 degrees for 30 minutes. One, can also spray the cones with a shellac or varnish paint spray to make them shiny. This will also keep them lasting longer. There is another way of doing it where you dip the cones in water till they close but it takes a lot longer and is a lot more work. I like the look of the open cones but they should really be spray varnished first. Slip a loop of wire around the cones base at the lower leaves and twist leaving a long tail, Proceed to wire them to the base fitting them close together.